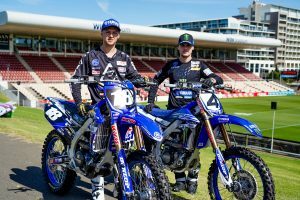 German contender equal second in 450SX title fight. Team Honda HRC’s Ken Roczen has expressed a sense of relief to exit the initial west coast rounds of the 2019 Monster Energy AMA Supercross Championships in full health. 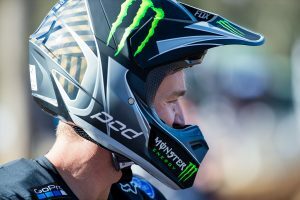 The talented German suffered a horrific season-ending – and almost career-ending – crash at Anaheim 2 in 2017, while last year his supercross campaign was cut short at San Diego with a hand injury. 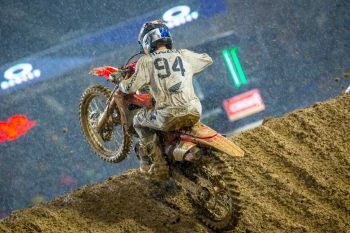 Saturday’s fifth stop of the current series at San Diego saw Roczen push through the muddy conditions to earn his third podium of the year, equalling him on points with Marvin Musquin (Red Bull KTM Factory Racing) in the championship standings. “Today was a really weird day,” Roczen reflected. “We didn’t even get on the track until after 5pm and only had the one qualifying practice. I got 12th, which wasn’t great, but the conditions were absolutely brutal. I got off to a pretty good start in the heat race and ended up winning, which was great. “Going into the main and being able to pick whatever gate I wanted was huge. I got off to such a good start, it was crazy, and actually almost went down in the first turn because it was so slippery but pulled it off; then I actually went down in the second turn, which I was really bummed about. “In those conditions, you don’t want to be anywhere but in the front. Going back to fourth or so was not what I wanted and just made it harder on me. I thought I was third most of the time but I guess I was second, and then Marvin [Musquin] got by me with just a turn left so I was pretty bummed. The AMA Supercross series heads to Minneapolis in Minnesota this Saturday for the first east coast round of the championship.